Delhi, 11July:India today introduced a set of two postage stamps to commemorate bilateral relations with China. The stamps depict two famous Buddhist temples, the Mahabodhi Temple of India and the White Horse Temple of China. 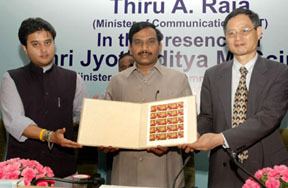 The stamps were released in New Delhi by the Communications and IT Minister Thiru A. Raja in the presence of Indian and Chinese officials. Leaves of the Pipal tree form the background of the two religious monuments. The stamps have been priced at Rs. 15/- each. The Chinese version of these stamps were released in Beijing last month during the visit of External Affairs Minister Shri Pranab Mukherjee. The common design of the stamps has been jointly done by Postal Departments of India and China. In his address, Mr. Raja recalled the centuries of cultural exchange between India and China and described Buddhism as the mainstay of the relationship. He pointed out that the joint stamp is a reminder of the friendly relations between the two countries. He said, regional cooperation will help improve the quality of service in the region. Speaking on the occasion, the Minister of State for Communication and IT, Shri Jyotiraditya Scindia observed that the two joint stamps are the finest symbols of the cultural binding force between India and China. The Chinese Ambassador to India Mr. Zhang Yan, Ms. Radhika Doraiswamy, Secretary, Department of Posts and delegates from both countries attended the stamp release function.